Q: With the many options availiable, why should we choose Air Control Products for our project? Since 1975, we have worked to earn a reputation for offering high quality products and a high level of integrity in our relationship with customers. Furthermore, we offer one of the most complete lines of products, saving customers a tremendous amount of time in their search. Q: Will you work with architects and/or general contractors? Yes, we are very experienced in working with both of these professions. In doing so, we lighten the load of all involved. Q: Is there a charge for discussing our building needs or design objectives with your company representatives? There is no charge. Our representatives are pleased to meet with you and share their expertise in all areas of your building design. Q: What percentage of FAQ’s are actually read by individuals other than the author of the FAQ’s? 3%. People compose FAQ’s because they were asked to do so by someone else, knowing full well that no one will ever read them. If you have read this specific FAQ, please call 440-526-3020 and ask for Rob Laneve or send Rob Laneve an email at rl@aircontrolproducts.com. Q:I saw a Price HVAC Engineering Handbook the other day and would like to know how I can get one of these books for myself? Please go to www.price-hvac.com/handbook and fill in the information to order a book direct from Price Industries. Q: What is the correct inlet velocity when designing a DuctSox fabric duct layout? This all depends on the duct layout and diameter of the proposed fabric duct. The ideal approach would be to size a system for lower inlet velocities of 1000-1200 FPM to reduce stress on the fabric, reduce noise while operating and yield a better balanced system. A “Rule Of Thumb” on maximum inlet velocities would be as follows - 1,600 FPM Maximum: For Straight Duct / 1,400 FPM Maximum: Inlet with Fittings. Inlet velocities greater than 1,600 FPM would not be covered under DuctSox standard warranty. Q:When and why should I use a “Permeable” fabric from DuctSox? For applications in which condensation is a concern, “permeable” fabrics yield the lowest possibility for condensation. Permeable fabrics create a film or halo of conditioned air around the duct surface - preventing the warm, humid ambient air to contact the surface. This halo of conditioned air acts as a thermal barrier extending the temperature gradient. Q: Can I get an explosion proof Greenheck CUBE or BSQ fan? A direct answer to this question is no. However, the all aluminum construction option of these fans is sometimes accepted as meeting the intent of the AMCA guidelines. AMCA has established guidelines for spark resistance, not “explosion proof.” These guidelines define spark resistance as A, B or C. Spark resistance C involves using a non-ferrous inlet cone and aluminum rub-ring, B involves using a non-ferrous impeller and aluminum rub ring and A involves using all non-ferrous airstream components. Typically this includes the inlet cone, impeller, housing, fasteners and rub ring. In the purest sense, a centrifugal “utility set” or “scroll housing” fan is the only geometry allowing only non-ferrous airstream components. Up-blast or inline fans, even when manufactured as all aluminum, contain various ferrous components (bearings, supports, etc.). Q: Why does the Greenheck CAPS selection software report “Motor Invalid”? A motor selection has many variables such as horsepower, voltage, phase, enclosure, insulation type, UL listings, VFD compatibility, and RPM ranges, just to name a few. Although many variable combinations are programmed into CAPS, occasionally a certain requested combination might not be programmed. In those cases, many times a Special Design Request can be submitted to Greenheck to obtain the desired combination. Q: Can the Greenheck fan models: SP, CSP, SQ, BSQ, BCF or BDF model fans be mounted vertically? Models SP and CSP can be vertically mounted, but the backdraft damper on the "B" design may not close depending on the orientation. Models SQ and BSQ can be mounted in any orientation, except for the larger/heavier motors need to be externally supported when the motor is on the side. Models BCF and BDF cannot be mounted vertically unless the internal vibration isolation is removed and replaced with solid studs. Q:	How much reduction can I get from a VFD on a Greenheck ERH unit? With VFD set up for full modulation the reduction can be set for 100% down to 50% of capacity. Q: Can SKYFOLD be used for exterior applications? Yes, our SKYFOLD Mirage XT partition is a revolutionary glass wall designed for exterior use. Q: How much ceiling room is required to store SKYFOLD? SKYFOLD is remarkably compact. In many instances, a folding ratio of 10:1 is achieved. This remarkable feature allows SKYFOLD to be stored in most existing ceiling spaces. Q: When stored away, does SKYFOLD take up any floor space? When not in use, SKYFOLD rests in its folded position, in the ceiling, requiring absolutely no floor space. In fact, in many installations, it is not even possible to tell if and where the SKYFOLD walls are located, until they are operated. Q: What type of structural support is required for SKYFOLD? SKYFOLD takes less structural steel than conventional operable walls since it is a static load. SKYFOLD’s loading on the structural steel is always evenly distributed across its width. SKYFOLD’s entire weight is never concentrated as a single point load on the structure. SKYFOLD weighs approximately 7.0 - 9.1 lbs/ft² (34.2 - 36.6 kg/m²), significantly less than conventional operable walls. Q: How does Smoke Guard save valuable floor space in a multi-story building? Smoke Guard can be used, in lieu of an elevator lobby, as a smoke and draft control assembly in front of the elevator hoistway opening. This gives the architect the ability to allow an elevator to open directly onto a corridor. By eliminating the elevator lobby, an architect can incorporate useful, rentable, square footage into other areas of the building. Q: Why should I use Thermaduct over traditional Sheet Metal Ductwork? Thermaduct is the only engineered high R-value, low air leakage outdoor duct solution that offers high efficiency air distribution. Because it is pre-manufactured, are assured the highest performance and energy savings available. Q: What insulation R value can I reach with Thermaduct? Thermaduct is available in a variety of thicknesses that supply R-8 through R-24 insulation value. Q: What is a simple solution to prevent catastrophic damage to a coil that could experience a freezing condition? Sentry Guard™. Sentry Guard is a “freeze relief plug” option from USA Coil and Air that can be applied to water or steam coils. The freeze relief plug will release pressure created by the freezing liquid before a tube or bend deforms and cracks open. This saves thousands of dollars in lost production time and in emergency replacement costs. Read more and view Sentry Guard sample guide spec sheet which is found under the heading Specifications on this page. Q: Can Thermofusers diffusers come with wall mounted thermostats? If so can multipule diffusers be controlled by one thermostat? Q: Which Metal-Fab duct do I use to vent high-efficiency, condensing-type heating appliances? Q: When designing a vehicle exhaust system how much CFM is required? When designing a vehicle exhaust system the required CFM is based on the range of engine sizes in cubic inches and not horsepower. 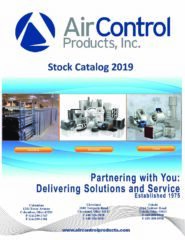 For complete information and free design services contact Air Control Products and we will provide this service at no charge. Q: For an existing UL qualified Fire, Smoke, or Combination Fire/Smoke damper, will changing or modifying the actuator impact the damper's UL rating? As always the Authority Having Jurisdiction makes the final decision in regards to what can and can’t be done to a life safety damper. In most cases removing an actuator and replacing it with a like, UL qualified actuator is acceptable as long other modifications like changing linkages are not made and the installer follows the requirements of NFPA 80 and 105. Q: For measuring airflow, when should I use pitot tube technology and when should I use thermal dispersion technology? Pitot tube technology relies upon total pressure and static pressure variations. This technology should be used when the airflow velocity is expected to be above 400-500 feet per minute. Thermal dispersion technology, also known as hot wire anemometry, relays upon electronics and a reference temperature. This technology should be used when the airflow velocity is expected to be below 400 feet per minute. Q: For a parking garage, what type of hazardous gas sensors should I use? For gasoline engines, carbon monoxide sensors (CO) should be used. For diesel engines, nitrogen dioxide sensors (NO2) should be used. Q: Is there a minimum flow when using an electric duct heater? A general rule of thumb is to have a minimum flow of approximately 70 CFM per Kilowatt of heat. Flows below 70 CFM/Kw will shorten the life of the heater due to overheating. Q: For a gas fired heating appliance with condensing flue gases, what type of flue material should be used? Condensing flue gases are very corrosive. Industry life-cycle testing has shown that a material known as AL29-4C provides the best life. The flue material should be specified as AL29-4C, but the outer casing can be of other materials such as stainless steel or aluminized steel. Q: Can you field change actuators from internal to external, or external to internal on a commercial control damper? Commercial control damper actuators can be changed in the field from external to internal, and internal to external on most control damper models. Consult factory for details. On smoke and combination fire and smoke dampers the actuator location cannot be changed in the field. Q: What is the purpose of a vertical blade control damper? A vertical blade control damper is often used in a restricted space condition. The vertical blade orientation allows an actuator to be mounted on the top or bottom of the damper, instead of the usual left or right side. Q: What is a momentary test switch and how is it used on a combination fire smoke or smoke damper? Momentary test switches are available as an option on FSD, SSFSD, OFSD, SMD, and SSSMD. This switch allows for a cycle test to be completed at the damper. One test switch is required per closure device. Q: How much cross leakage is expected through the energy recovery wheel? Cross leakage through the energy recovery wheels ranges from 2% to 5% between the supply and exhaust air streams. This amount of cross leakage is minimal and in comfort ventilation applications is perfectly acceptable. These leakage rates are also acceptable for Class 3 Air (toilet room exhaust). According to ASHRAE Standard 62-89R committee, up to 10% cross leakage of Class 3 Air is acceptable for the purposes of energy recovery. Q: Can the Price PRTU (Price Rooftop Unit Controller) communicate with multiple packaged rooftop units when installed to condition individual zones in an office building? Yes with the web server option. The web server provides the capability to show and change the package rooftop functions as well as zone points such as room set point, fans, stages of heat/cool, etc. The web server will show all package rooftop units connected to the communication bus and will allow remote monitor and trouble shooting. Web server can also provide alarms and send alert emails.